Orbital ATK’s re-engined Antares launch vehicle was fired up on its Wallops launch pad on Tuesday for a critical test ahead of resuming cargo flights to the International Space Station. Antares soared to life for 30 seconds to demonstrate its new RD-181 engines and test out the repaired launch facility. 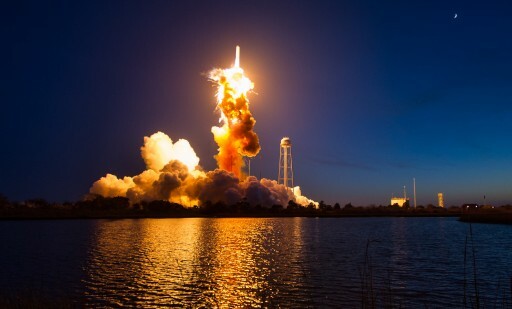 Antares had to stand down for over a year and a half after its October 2014 launch failure that claimed the loss of the Cygnus Orb-3 spacecraft headed to the International Space Station for Orbital’s third operational resupply mission under the Commercial Resupply Services contract with NASA. Lifting off under the loud thunder of its twin AJ26 engines, Antares had barely left the launch pad when one of the engines suffered a catastrophic failure 15 seconds after liftoff, causing the 45-meter tall rocket to fall back onto the launch facility in a powerful explosion. A detailed investigation of the mishap showed that the AJ26 engine residing in the Main Engine 1 position suffered a failure within its Liquid Oxygen turbopump, likely as the result of a material defect on the converted NK-33 engine built back in the 1970s. Orbital ATK (then Orbital Sciences) was planning to move away from the converted Soviet engines before the accident occurred given their age as well as their limited supply as only 43 NK-33 engines were imported to the U.S. for conversion by Aerojet Rocketdyne. 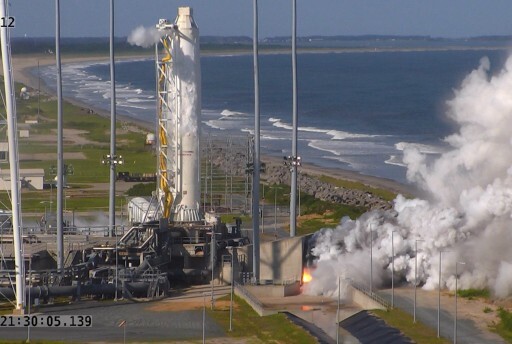 After the dramatic launch failure, Orbital decided to accelerate the switch in engines and no longer fly the Antares rocket with the converted powerplants. At Pad 0A of the state-run Mid-Atlantic Regional Spaceport, repair efforts were started shortly after the failure and continued for nearly one year. None of the pad’s structural systems received damage when Antares fell back onto the launch facility, and repairs were limited to the above-ground piping for propellants and commodities as well as other ground support systems such as lightning towers. The $15 million repairs at the launch pad were finished in September 2015, transitioning the facility back to a functional state to support Antares missions. Within two months of the failure, Orbital announced the company had selected the Russian RD-181 engine built by NPO Energomash. The engine is the smaller brother of the RD-180 also imported to the U.S. to power the Atlas V’s first stage sporting a pair of combustion chambers. With only one chamber, RD-181 is an adaption of Russia’s RD-191 engine featuring some structural changes to permit integration with Antares. Both, RD-191 and RD-180 find their origin in the even larger RD-170/171 with four chambers, used on the Energia and Zenit rockets. Although RD-181 provides a higher performance than AJ26 and is considered more reliable, the two share the same combustion cycle and operate at very similar mixture ratios, allowing Antares to keep its original tank dimensions and use existing core stages built in the Ukraine. Moreover, the structural system of the RD-181 was adapted to keep the same engine section dimensions on Antares, eliminating the need for extensive ground system modification. The only change on the launch pad is found within the purge system as RD-181 requires a warm nitrogen purge to remove air and other combustible substances from its plumbing prior to ignition. While the change of engines is a rather significant measure, Orbital managed to make only minimal changes to the configuration of the first stage and the overall architecture of the Antares rocket, moving from the 100 series to the 230 configuration. Overall, the Antares 230 configuration – with two RD-181 engines installed on its business end and keeping the Castor XL solid-fueled upper stage – will deliver a 25% increase in payload capability – owed to the higher thrust and specific impulse of the RD-181, increasing Antares’ liftoff thrust by 13%. Operating at higher thrust and impulse, the RD-181s burn propellant at a greater rate than the AJ26 engines, bringing the duration of the first stage burn from 235 to 214 seconds. A detailed overview of the new Antares 200 Series and the RD-181 engine is available here. To keep the company’s obligations to the International Space Station Program, a pair of Cygnus missions were conducted in December 2015 and March of this year using the Atlas V launch vehicle operated by United Launch Alliance. An inherent part of design work going into Cygnus was to make the spacecraft compatible with multiple launch vehicles, a feature that proved crucial during the long stand-down of Antares missions. The first RD-181 engines were delivered to the United States in the summer of 2015 and work started at the Mid Atlantic Regional Spaceport on Wallops Island to fit the new engines onto the Antares first stage on a path to a hot-fire test to verify the new launch system architecture. The first Antares 230 core stage was moved to Pad 0A on May 12 for a long test campaign, starting with fit checks of the various ground systems and the launcher. Testing ahead of the Static Fire test included a tanking drill on May 22 in which the Core received Kerosene and Liquid Oxygen propellants as well as Helium pressurant and various different purge flows. 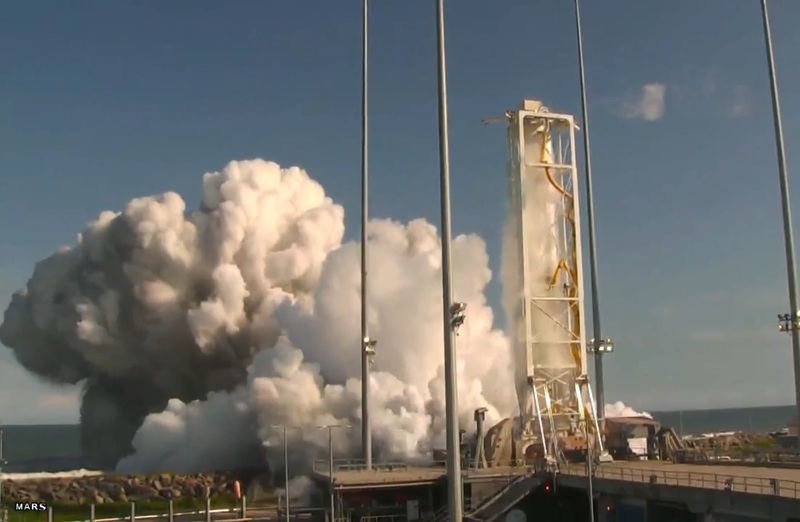 With initial testing going smoothly, Orbital ATK lined up the Static Fire attempt for Tuesday during a 195-minute window opening at 5 p.m. local time (21 UTC). Antares came to life at 21:30 UTC when the two RD-181 engines stared up and throttled to a combined thrust of 392,000-Kilogram-force for a 30-second firing. The test was not as simple as running the engines for half a minute as Orbital ATK planned to test out the full capabilities of the new propulsion system to uncover any adverse modes between the engines, core stage and ground system. The Static Fire was designed to test out different operational environments of the engines seen during the vehicle’s climb into orbit. The engines were commanded through different propellant mixture ratios and throttle stages to verify stable parameters within the operational mixture envelope. 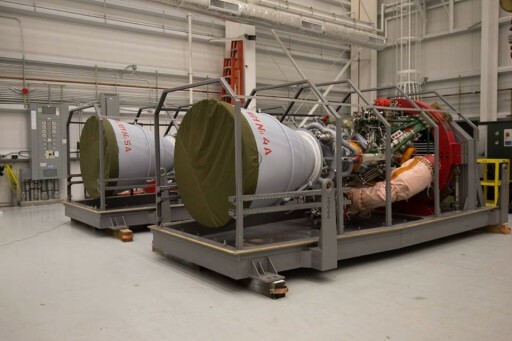 A series of Thrust Vector Control tests were completed to validate the TVC system of the engines as well as new engine controllers built by Orbital ATK based on the specifications of the RD-181. After the test, the launch vehicle was safed and teams headed into de-tanking while beginning to pour through a wealth of data collected as part of the brief engine firing. Early indications showed that the new propulsion system, the core stage and the launch complex worked as planned. 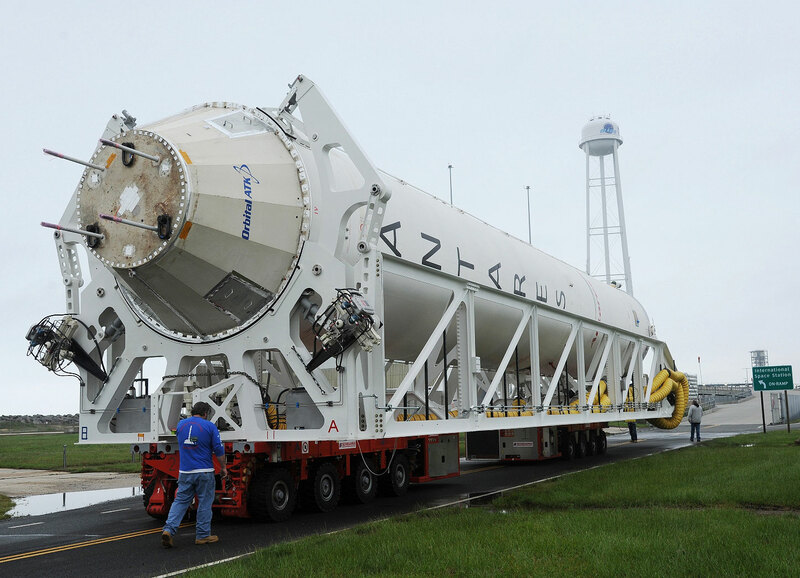 The Antares core stage will remain upright on the pad for additional testing completed over a period of days before returning to the Horizontal Integration Facility to undergo in-depth inspections of the engines and vehicle structure. 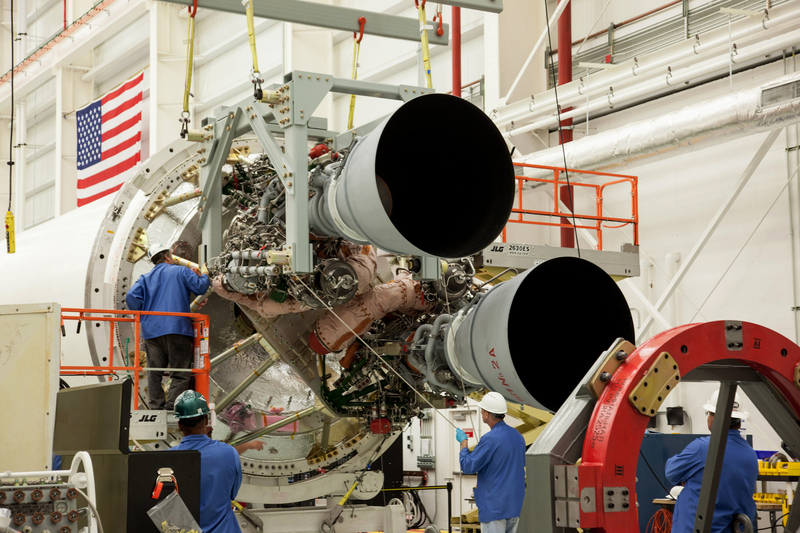 If no problems are found, Orbital ATK currently targets July 6 for the launch of the Cygnus OA-5 resupply flight to the International Space Station. 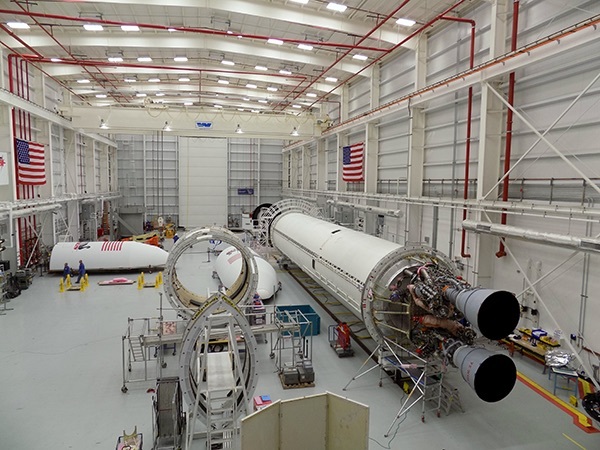 The Antares rocket used for OA-5 will not be the same core stage that completed Tuesday’s static fire. This is because of a lengthy refurbishment process required by the RD-181 engine after a firing, requiring membranes and igniter fluid ampules to be switched out. The core stage involved in the Static Fire will be turned around for launch on the OA-7 mission currently looking at a launch date in late December. Orbital ATK received a $1.9-billion contract for eight cargo missions to ISS as part of NASA’s first round of Commercial Resupply Services. The existing CRS-1 contract with Orbital ATK was extended twice – two more missions were booked in 2015 and one more earlier this year to bridge a gap to the second round of CRS contracts. In January, the Commercial Resupply Service providers for the period of 2019 to 2024 were announced by NASA. Covering the Station’s cargo needs during this six-year period will be SpaceX, Orbital ATK and Sierra Nevada Corporation, a newcomer to ISS cargo ops with the company’s Dream Chaser spacecraft. As part of the initial CRS-2 contract round, each company was guaranteed at least six missions. 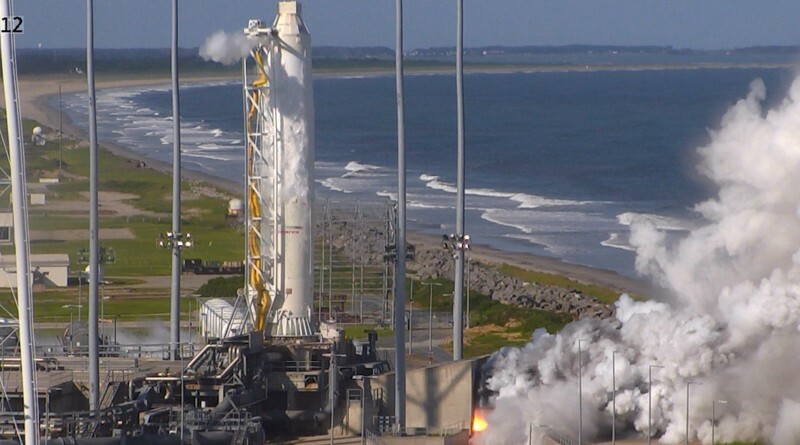 With its selection for CRS-2, Orbital ATK currently looks at flying the Antares-Cygnus combination two or three times per year, providing the company with a solid foundation to increase the market reach for Antares. Orbital ATK has yet to secure a commercial customer to fly a satellite on Antares which is suitable for medium-sized spacecraft heading into Low Earth Orbit, capable of lifting up to seven metric tons. Also in the cards for Antares is a future upgrade to a Series 300 vehicle with a modified core stage to take on more propellant to optimize the vehicle for the RD-181’s performance, providing a further increase in payload-to-orbit.